Greece is once again at odds with its Eurozone lenders, after Athens’ decision to hand out Christmas bonuses to its people caused Brussels to scrap short term debt relief measures. European creditors demand more austerity, while public anger over continued cuts keeps growing. The refugee crisis is putting extra strain on the Greek economy. As more migrants arrive at its shores, Greece is demanding the EU’s help to deal with a growing number of asylum-seekers. Can Greece contain the escalating tensions at home? And does it risk a new economic meltdown? 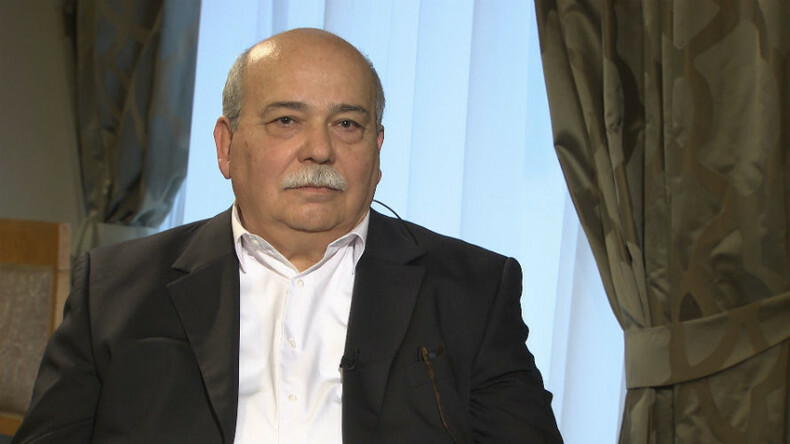 We ask the Speaker of the Greek Parliament, former Interior Minister Nikos Voutsis. Sophie Shevardnadze: Mr. Voutsis, the European Commission decided a few days ago that EU countries may deport the migrants arriving through Greece back to your country. But refugee camps in Greece are overcrowded as it is. How can Greece take even more people? Nikos Voutsis: The most important thing today is that all the EU members should act responsibly and honor the commitments they made at EU summits and meetings. They have a responsibility to 160,000 refugees, of which only 10 percent have been resettled. We have to begin implementing the migrant redistribution agreement which should help these migrants and reduce the burden on Greece, since Greece - along with Italy - has been bearing the brunt of accepting the arriving refugees. Today is not the time to talk about re-launching the Dublin Regulation. Our country simply can’t handle the flow of migrants alone. We can only do so much. Under current circumstances, existing agreements, including the agreement on migrants with Turkey, are on the verge of collapse. SS: Let’s talk about this issue of responsibility you’ve mentioned. When the Balkan route was shut down, this stopped the migrant flow to other EU countries, but the number of migrants in Greece keeps growing. So is your country the one shouldering the huge burden of the refugee crisis today? NV: At the moment, yes, but it can’t go on like this. Some countries, especially those of the Visegrad Group, have adopted an extreme position. They want to have so-called ‘hotspot’ countries in Europe which would receive refugees - like Jordan and Lebanon do in the Middle East . Obviously, our country, as well as most other countries in the EU, don’t support this approach. I hope the situation will gradually improve, and in the future we won’t have to face the closing of borders, as it has been happening up until now. SS: EU countries promised to resettle the migrants who are currently in Greece, but only 6,000 out of 60,000 have been relocated so far. Does it mean that the EU refugee redistribution plan has failed? NV: I have mentioned that 160,000 migrants in Greece and Italy are waiting to be relocated to other EU countries. The EU has made a number of decisions on this matter. We think that 160,000 people is a reasonable figure that EU states can accept. EU countries should be able to resettle this number of migrants and refugees over the next 12-18 months. But so far most states are reluctant to implement the decisions that have been made. Unfortunately, there’s too much hypocrisy between our countries. We face double standards: they want us to follow EU rules and decisions when it comes to our country’s debt, but in dealing with the migrant crisis other countries think it’s OK for them to ignore the decisions made by the EU. SS: Do you have a feeling like the EU wants to pay its way out of its responsibilities? Most states don’t want to receive refugees, so they’re just sending money for you to take care of the problem? NV: No, they don’t send us money. On the contrary, they provide only a tiny fraction of the funds they promised to provide and do only a small portion of the things they promised to do when it comes to additional personnel, money for NGOs, assistance in resettling refugees, etc. The Greek government and the people of Greece have to bear the brunt of the migrant crisis. We don’t get any material support, even though we’re in the middle of a major economic crisis. The same goes for Italy. You may even remember that the Italian government asked to subtract expenditures related to the migrant crisis from the surplus and annual growth statistics, but Germany, which is behind the decision-making process in the EU, refused to do that. SS: Greece is supposed to send illegal migrants back to Turkey, where they came from. Every day, around 90 people arrive in Greece, and only a handful of them are deported. Why is that? NV: There are international rules and agreements. There is a complex procedure to determine whether a person is entitled to asylum. Or, on the contrary, a decision may be made to send them back to where they came from. In this case we’re dealing with Syrian refugees who may be sent back to Turkey. But currently this system doesn’t work because of a large number of international problems. Even though the deal with Turkey did help Greece to cope with the incoming wave of refugees, we should say frankly that this deal raises questions about human rights which can’t be answered. SS: In exchange for its assistance with migrants, Turkey was promised that the EU would expedite its bid for EU membership. The relationship between Greece and Turkey is complicated. Will Greece oppose EU membership for Turkey? NV: Ever since the issue of Turkey joining the EU first came up, Greece has been one of the few countries consistently and genuinely supporting its bid and helping it with the process. We are neighbors with Turkey, and even though we may experience tensions from time to time, we should seek peace. And, as far as the economy is concerned, we can all be part of the same family. But given the current situation in Turkey and problems with people’s constitutional rights, obviously, it will be hard for the country to join the EU at this point. I’m not talking about Greece but there are countries which adamantly reject the idea of Turkey joining the EU regardless of Turkey’s domestic issues or Mr. Erdogan’s policies. SS: While Turkey is seeking to become part of the EU, the UK is on its way out of the bloc. In your opinion, will Brexit bring about further dissolution or, on the contrary, it will reinforce the union? NV: Will Brexit make the EU stronger? In no way. Today, the EU faces a great number of major issues which have emerged due to the lack of a single policy, of a unified strategy, of determination and, perhaps, absence of competent leadership for quite a while. For example, the migrant and refugee issue and the economic crisis which has been dealt with by introducing austerity measures following the German Protestant logic. These are the two elements which really put the EU to the test. If there are no prompt actions taken to create a new EU architecture then the union will face difficult times, because today we see radical, racist, fanatic, far-right and fascist movements coming back to life in many countries of the union. We should pay more attention to this. SS: Germany's Finance Minister has said that there will be no place for Greece in the Eurozone if it does not implement reforms. Will your party continue to make concessions to creditors in an effort to preserve the euro? NV: The confrontation with those whom I’d call fundamentalists of the neo-liberal economic thinking concerns not only Greece but the whole southern part of the union, that is Spain, Portugal, and Italy as well. It manifests itself in other countries too – in Central Europe, namely Belgium, Finland, and the Netherlands which until recently used to be revered as examples of economic well-being and had been given the highest credit rating of AAA by international agencies.The intensity and number of reforms carried out in major sectors of the Greek economy are supposed to be contributing to the well-being of our people. But we don’t want our youth to move out of the country so that there is no one left here but the elderly. There are tensions with EU countries over the crisis in Greece, and there are disagreements with the IMF and various EU institutions, which are becoming increasingly sharp right now. SS: Non-establishment parties, both on the right and the left, are gaining ground across Europe, and you too, Mr Voutsis, represent a non-establishment party. Will this tendency lead to systemic changes in the EU, and, in your view, what kind of changes? NV: I want to say that we do not share the same position with some of these political forces. There are forces like Syriza in Greece and Podemos in Spain, as well as other left-wing elements of the traditional social democracy which think that the crisis can be overcome only by joining forces, defending the rights of working people, and upholding European values. But there are also those on the right and left who want to return to a Europe where each country would be shut closed and everyone would fend for themselves. According to their logic, there should be some 40-50 new national entities which would compete with each other. Their policies would lead to further disintegration, more barriers not only across the world but between each separate state in Europe. It is evident that this far-right anti-system logic has nothing to do with the concept of a united Europe, unity of nations, and progress, which is being advocated by other parties, one of which I represent myself. SS: Your party champions social protection and at the same time you are firing people, cutting retirement benefits, and cutting state spending – don’t your voters feel betrayed since Syriza had been promising something completely different? NV: I will be absolutely frank with you. We don’t fire anyone, and that is the huge difference between our course of action and other political neo-liberal programs suggested by the opposition, namely Mr Mitsotakis. Quite on the contrary, we have managed to reduce unemployment by 3.5%. We continue to pay social benefits and we do what we can to support strategically important sectors of our economy. True, that demands certain radical measures to be taken. We have to make concessions, significant ones, and that in fact troubles our conscience and affects our relations with the people. Yet we had presented our program to the Greek people during the second elections in September last year and they supported us. We hope that Greece will make it to the global markets in the end of 2017 despite the difficulties we face. All international agencies speak to that. Now we expect economic growth to reach 2.7%. Our party has the mandate until 2019 and until then we will do our best to abandon the austerity measures that cause so much pain and troubles to our country. SS: Prime Minister Tsipras’ popularity has been waning, and we’re seeing pensioners protesting and trade unions going on strike. It’s not as large-scale as it was before your party came to power, but the unrest is there. Do you think these protests will it die down or do they pose a threat to your government? NV: Your question illustrates how well you understand what’s going on in Greece. I can tell you frankly – not as the Speaker of the Parliament, but as one of the key members of the ruling party – that there is no threat to our government. Nor is there danger coming from the opposition or opposition media outlets or our international partners and creditors. But what we do risk is ruining our relationship with our people. The most important thing for us is how people react to the tough measures we are forced to implement. It’s imperative that people have hope that things will change. For us it’s a challenge, and next year will be crucial in this respect. Soon our country will join the European Central Bank's quantitative easing program, which, combined with the Juncker’s Investment Plan, will allow our economy to grow so that we can enter international markets. We want our people’s day-to-day needs to be satisfied, and of course they protest now, but there is no other way. I’d like to point out a few of our achievements. We provided 2-2.5 million Greeks that have no medical insurance with access to the healthcare system and allocated 620 mln euros out of our budget surplus to pay Christmas bonuses to those in need. SS: The IMF thinks that what the European creditors are doing is harming the Greek economy. Do you take the IMF’s opinions into consideration? NV: We have to, though even now, 6 years later, we still don’t understand what political decision resulted in Greece, an independent European country, going to the IMF and having to implement the measures imposed on us. We’re still looking for an answer to this question. The fact is, the ‘treatment’ that the IMF prescribed for our ailing economy wasn’t the correct one, because they applied a copy-paste approach of sorts, used to reinvigorate the economy of poor countries. It would have been better not to have to deal with the IMF. That’s what we think, even despite the fact that now the IMF says our debt can be serviced differently and that the current situation is unstable. SS: The IMF and Brussels used to present a united front, but now Brussels insists on Greece continuing the austerity reforms while the IMF believes new reforms are not needed and are in fact harmful, and even the previously implemented measures are too much. Why is the European Commission pushing for such tough measures? NV: I’d say it’s predominantly the IMF that recommends tough measures, not the EU. They insist we have to cut public spending on pensions, wages and social benefits and keep facilitating layoffs among civil servants and other workers. This is all in the IMF package, but contradicts the EU norms. The problem with other institutions, meaning Brussels, the ECB and German Finance Minister Wolfgang Schauble’s policies in particular is that they want Greece to show very high economic growth – 3.5% a year - over the next few years, which is impossible for an economy that’s been in recession for seven years. It’s a suicide propeller! We proposed achieving a surplus of about 2-2.5% instead, which is what Prime Minister Tsipras is currently negotiating. In addition, 1-1.5% of the surplus would be allocated on social benefits, supporting the competitiveness of the Greek economy and small and medium-sized businesses. This is the compromise we’re putting a lot of effort into achieving now. SS: Germany, Greece’s largest creditor, doesn’t want to write off your debt. With the upcoming elections, the politicians don’t want to explain to the voters why their money is being spent on Greece. So I guess Greece shouldn’t expect any concessions when it comes to its debt any time soon? NV: I can honestly tell you that Germany’s current policy is at odds with its own interests. First of all, I should point out that Greece paid off most of the loan to the creditors and partners, to the banks, directly or indirectly, Germany included. It’s even possible that Germany benefitted from what it loaned over the years. So it’s not an economic issue. I’d say it’s a political one and it has to do with what the EU chooses to do in order to strengthen its economy. Back in 2008, when the crisis began, the US handled it by putting more money in circulation and stimulating demand, which helped easily bring down unemployment rate by 5 or 6 per cent, while Europe picked austerity advocated by Germany. As a result, large countries and their banks make money, while smaller countries lose money in the long term. This will be a key issue in the election campaign. Mr. Gabriel and other politicians, Mr. Steinmeier and Mr. Shultz, will be running in this election. The Social Democratic part of the coalition that usually comes together in Germany is in favor of easing Greek debt and want a different policy regarding Greece and its debt. But we’re definitely not going to wait for the outcome of the election to solve this issue. SS: The latest installment of the bailout package allows Greece to continue paying off its debt. But is there any money left for economic development and investments? NV: Currently – no. The situation that we’ve had in the past six years would not let us spend any money on investments or encouraging investment. All the money had to go towards our debt obligations. At the same time, we have been experiencing recession – the GDP in Greece went from 225 billion to 175-178 billion if I am not mistaken. You have to understand that our country is on the brink of humanitarian disaster. 250,000 young scientists have left the country. They are our most valuable asset, because all education in Greece is state funded. This treasured capital is now benefitting Theresa May in the UK, as well as Hollande and Merkel. Well-educated scientists, doctors, engineers… If this trend continues, Greece and the Balkans in general will turn into a special economic zone lagging behind other EU countries. This process must be stopped, that’s why we keep saying that the problem of Greece is the problem of the whole Europe that puts its future in jeopardy. SS: Is there an alternative to austerity measures at this point? NV: Of course there is. Currently our country is the only European economy not included in the quantitative easing program, which got a trillion euros in funding. Maybe it happened because of SYRIZA coming to power – we will never know. If we are included in the QE and the Juncker investment package as well as some other programs this may significantly improve the economic situation. But to be honest, we need to adjust the Greek tax system. The Parliament is a preparing a law on plastic cards so people can’t avoid paying the VAT. We are implementing a number of reforms in the country that could lead to new possibilities. But you have to understand something else. The whole world knows and now Greek politicians need to admit it as well – there are two different Greeces. On the one hand you have Greece with 200 billion euros in Swiss banks, money in Amsterdam ports and London districts. During Christmas, there will be a lot of Greeks at European ski resorts. It is not a coincidence that our country went bankrupt after the 2004 Olympics when one part of Greece suffered under pressure while the other part enjoyed their riches and sent money abroad. SS: I would like to talk about the relations with Russia. Gallup poll figures show that 62 %(89%) of Greeks do not support anti-Russian sanctions. How can you continue this policy when the whole country is against it? NV: As you know Greece is a NATO and EU member but we try to make sure that our voice is heard. We try to express our opinion. For example we have the biggest NATO base in Souda Bay off the Crete coast. But we’ve also had tensions with Turkey and other NATO countries to the point where we even suspended membership for a period of time. The same could be said about our role in the EU. We consistently support the agreements that Russia is involved in – the Minsk agreements for example. We also want sanctions to be eased or lifted altogether. I know that certain groups in France and Germany want to reinforce the ban. It is a serious problem that our country wants to solve and does everything in its power to change this EU policy. We need to take measures in areas that affect our countries’ trade and economy. It is not easy to solve the issue. It is a European problem and we have to work towards lifting the sanctions when there is progress in fulfilling the obligations that have been agreed upon between the sides. SS: But is it only the European politicians that get to decide this? During his visit to Moscow your prime minister said that the sanctions should be lifted. Just recently President Obama was in Greece where he stated that countries decided to continue with the anti-Russian sanctions. The US President-elect - Donald Trump - is changing the rhetoric towards Russia. If Trump decided to ease the sanctions policy would the EU support him? NV: Frankly, I don’t know what kind of policy the EU will choose, if it decides to follow the US or implement some new political vision of the problem. As you are well aware the new US president does not have a clear stand on a number of issues – we are yet to determine what his approach is going to be. And many of them are major policies. I am talking about American relations with the IMF, BRICS, China that owns 40% of its national debt. All these issues are connected. America’s foreign policy, its relations with the EU and anti-Russian sanctions will depend on the “big picture” – priorities that Trump will set. This is also true regarding various trade agreements (TTIP, CETA, and TiSA). We will have to see what decisions the European Union will make. SS: I am just trying to understand the degree of independence in the EU’s decision making process. Do you think the European Union can go against the US in its decisions? NV: Unfortunately there is very little independence in that respect. The EU is a lot less autonomous now compared to the time when it was first formed. Yes, we say that we have our own policies and institutions, that we are independent. We set our own foreign policy – we have our High Representative for Foreign Affairs, but I don’t even remember this minister’s name, some lady. NV: Yes, right. But nobody in the EU puts forward their own initiatives, it is obvious. We can see that in the context of the Ukrainian issue, anti-Russian sanctions, as well as the crisis in Northern Africa and the Middle East. As a result we now have thousands of desperate people from these devastated countries flooding the EU. And there is also increased terrorist activity in Europe. What I am trying to say is that the EU’s foreign policy is in embryonic state, it is behind the curve, and we are paying for it.